Here at the International Water Institute, the GIS group has been quite busy working on hydro-conditioning for our Prioritize, Targaret, Measure Application (PTMApp). We have been scouring the landscape of the Red River Basin, and during our work, we have come across a few interesting features that we would like to share with you. 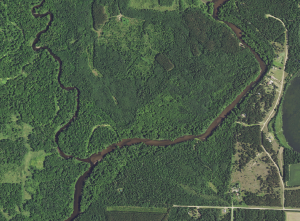 The first set of images comes from the Mustinka River watershed in west-central Minnesota. 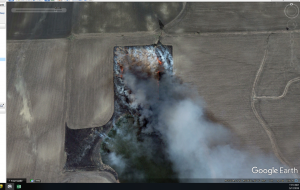 While looking through this watershed, Kyle Glowa came across a controlled burn. 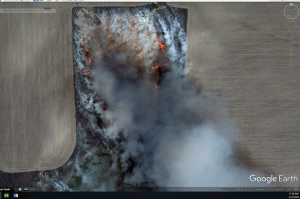 The practice of controlled burning is very common in the Red River Basin and seeing it from an aerial view provides an interesting perspective. The second set of images were found by Mitch Braget and show some creative ways at solving water flow. When one culvert isn’t enough just keep adding more. During our hydro-conditioning process we are looking for culverts to help route water flow through our model and visual confirmation from aerial imagery is always a plus but for our purpose it still only counts as one. Another feature found by Mitch was located in the Chippewa watershed. As we can see in the image, that is one well designed star – or perhaps it is a pentagram used for more…nefarious purposes. 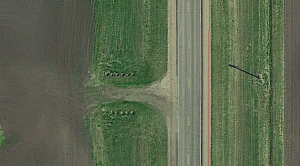 Whatever its purpose, clearly the individual responsible has experience mowing symbols into fields. 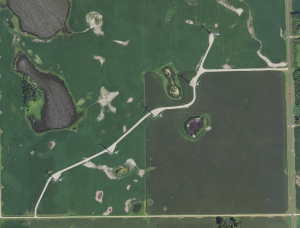 The next set of aerial images were provided by Austin Braget and show windmills in the North Dakota portion of the Red River Basin. Windmills are a common sight in North Dakota because rare is the day that the wind is not blowing in North Dakota. 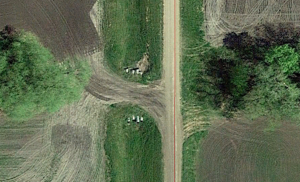 The ones in these images are found in the Maple River watershed just west of Fargo. 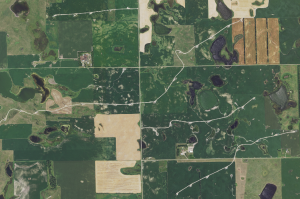 These images show just a fraction of the number of windmills located within the Maple river watershed as these wind farms are quite extensive in size. 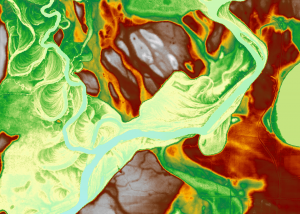 While working on hydro-conditioning, we often use aerial imagery and digital elevation models (DEM) together. By looking at the DEM we can see interesting aspects of features that would otherwise be difficult to see in the aerial imagery. For instance, the first image below shows one river flowing into another. 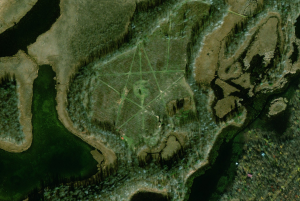 We can see from the image how heavily forested the area is, making the underlying surface difficult to see. But if we look at the DEM in the second image we can see how our river has moved around the flood plain with the red areas having higher elevation and green areas having lower elevation. Our meandering river has not always been in its current location. This kind of DEM signature is common for meandering rivers and it is interesting to see how the movement of water can shape our landscape.